Fly to Luleå (via Stockholm). 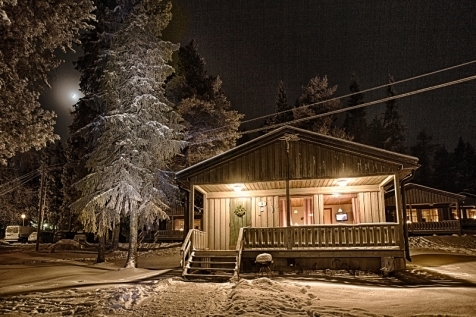 A guided transfer will take you to Brändön Lodge, where a 3-course dinner will be served in the main lodge. Enjoy a digestif in the bar whilst keeping an eye out for the Northern Lights. 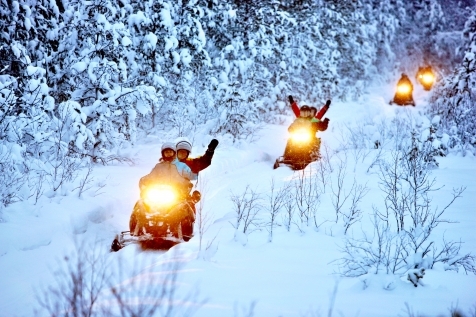 After breakfast you will explore the unique features of this region with a 4-hour snowmobile tour. Travel across glistening ice and islands of the Luleå archipelago. Your guide will tell you about life in the northern wilderness and you will get the opportunity to try ice-fishing. Your goal is Brändöskär, an idyllic 17th century fishing village situated the outer reaches of the archipelago. Here pack ice and snow can form 10m high barriers. Warming drinks and lunch are cooked over an open fire. Returning to Brändön Lodge, your afternoon is at leisure before dining in the main lodge. With luck you may enjoy a panoramic aurora display whilst enjoying the lakeside sauna and bubble pool. Enjoy a leisurely morning. Snow shoes are on hand should you wish to try a fun-filled walk before lunch. This afternoon you will transfer to a local husky kennel. Here you will learn how to mush your own team of dogs and then, driving in pairs, you will embark on a thrilling ride through the forest and along the lakeside trail. Take it in turns to be both passenger and mush. Return to Brändön Lodge for your final gourmet dinner. Breakfast before your transfer to the airport in time for your return flight home. The cottages at Brändon Lodge are simple yet warm and stylish. Each cabin has 2 bedrooms, a kitchenette, lounge, bathroom and veranda overlooking the frozen sea. 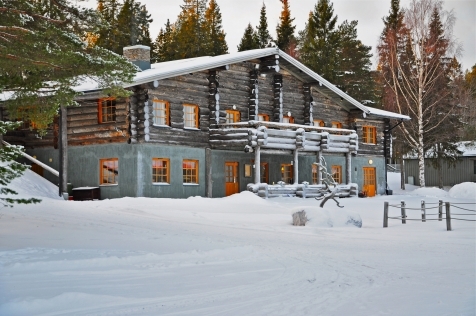 The main pinewood lodge houses a cosy bar and restaurant, where Head Chef, Johan Hedenström designs imaginative menus based on locally-sourced produce. Johan is equally at home cooking in the kitchen as he is over an open fire in the Arctic wilderness. The facilities on hand are topped off by a lake-side sauna and bubble pool. Unique to Brändön Lodge, this specially adapted hovercraft is an exciting way to explore Luleå’s frozen archipelago. Look out for local Arctic wildlife as the hovercraft zips across the ice-covered bay. There is a stop to allow you to walk on the ice and marvel at your remarkable surroudings. Be like Bear and find out how to dress and survive in the Arctic. No previous experience is needed and equipment is provided for this fun introduction into winter life in Swedish Lapland. Learn to snowshoe and make a fire in the snow. Discover the secrets of the forest and survival methods of the Arctic wildlife and contemplate the extraordinary skills that enable life to flourish in this landscape. Relax and enjoy a wilderness lunch, which is served in a traditional Sami hut. 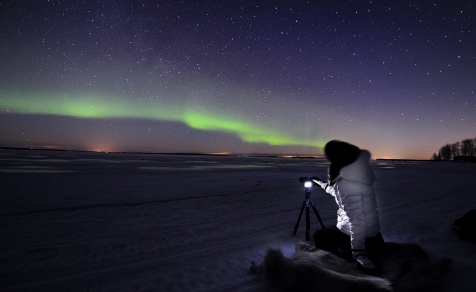 Join the search for the northern lights. 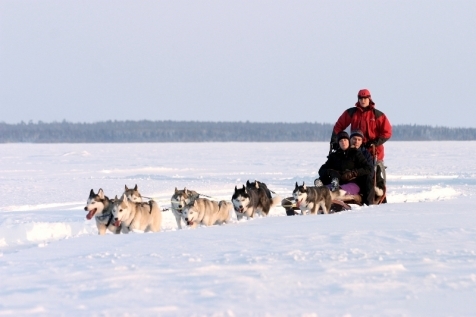 Board a snowmobile sled, filled with reindeer pelts and snuggle under the warm blankets. An expert guide then pulls you across the frozen sea. As you travel between the frozen islands, any light pollution fades and you have the perfect setting should the northern lights make an appearance. Snowshoes have been the footwear of choice for thousands of years and are ideal for traversing across deep snow and allowing you to explore otherwise inaccessible terrain. Easy to master, you will soon be following your expert guide into the surrounding Brändö forest. A rest stop is taken by an outdoor fire and if you are lucky and the conditions are right, the northern lights may light your way. Your expert guide will drive you by snowmobile sled across the frozen ice, to some of the best fishing locations. Drill a hole to the water below and enjoy hot drinks and sweet bread whilst waiting for a bite.